If you are amongst the Bronco-Obsessed (not to be confused with B.O. ), then this is the App for you. 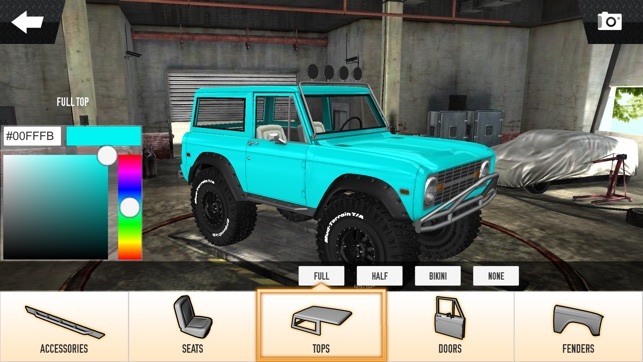 Within it's hallowed virtual halls, you'll find everything necessary to customize your Bronco, from bumpers to tires to roofs to decals, all within the comfort of your own phone and without the need to spend the cash. Get the look and feel that's right for you, and save it so you can show off your next "Dream Build". Your knuckles will stay unmarred...your wallet will remain full and your greasy hands will become suddenly less greasy...thanks to the App's ability to let your imagination run amok with a mere swipe of your finger. There's even a handy "Notes" section where you can log maintenance for your Non-virtual Bronco (i.e. the one made of metal, probably sitting in your garage). Starting with a Stock Bronco, change paint color, tire size, lift etc. You can even create the ultimate Rock Crawler! Don't say we didn't warn you. It's more addictive than, well, other addictive stuff. Added new paint feature: when selecting paint color for individual bronco parts, new button allows user to select bronco body color. 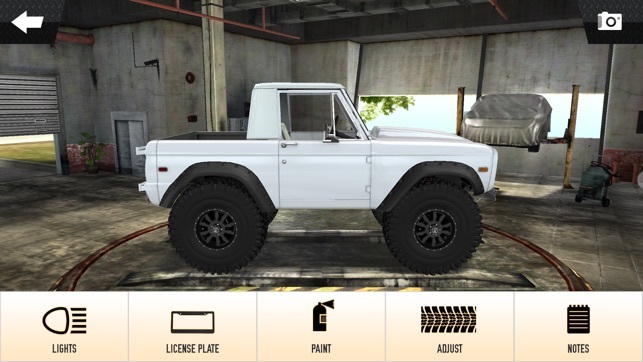 This "Use Body" color button basically automates the bronco painting process. 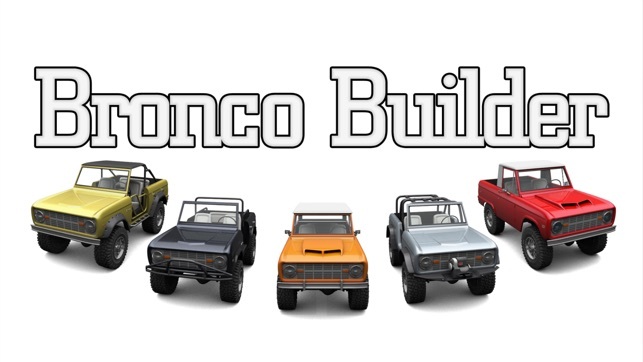 Set the color once, for the bronco body itself, and use the body color button to assign the same color to each and every paintable part. Removed Share on Facebook button. As a design app for Early Broncos, the app is fun, but incomplete for the price. It has the potential to be a go-to app for bronco lovers with some improvements. #1 suggestion, associate a lift height value with the lift slider. I found this app very useful for tire selection, but am I creating a 2", 3", 4" lift? Body lift? I think all bronco lovers who want to adjust their lift would want an idea of what it would look like if they raised their rig by an inch or two, but they need a numerical value to make a purchase. #2 share/email functionality with all specifications. when you choose white as a color, it comes out a greyish color, so white should be white, color selection on decals, old school original paint schemes including stripes and body moldings, more options on roll bars, color of seats, type of seats. Full doors without window frames 66-68 frames are removable. Default original paint colors like Candy Apple Red. Ford's permission to use their name to use lettering on front and back. Gas cap color and hinge color (Chrome) Original hubcaps. Add vendors such as Bronco Graveyard, Toms Bronco, BC Bronco.... Engine designer? Coyote Engine? 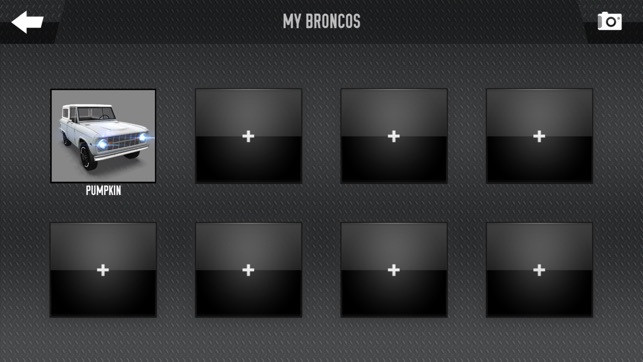 Things that are good: RGB color selection for custom paint, tire selector (awesome), multiple Broncos. Garage is cool. 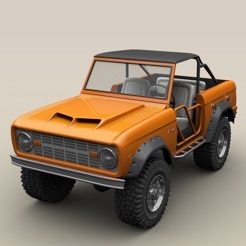 This is such a cool and useful app for dreaming up ideas for your own bronco build. Possible things that could be added are: the ability to adjust color for dash, seats, and all trim pieces. And ability to add trim and stock hubcap style wheels. But the app is awesome! I have wanted something like this for years. Great job!